Are you over 40 and been told that LASIK is not the best procedure for you? 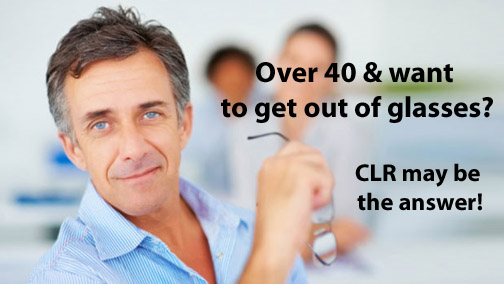 Clear Lens Replacement, known as CLR, has become the rage for people over 40 that want to be less dependent on glasses. The new high tech lens implants help with distance, intermediate and near, unlike LASIK that only offers distance vision correction. And the best news is that they will never get a cataract or have to have cataract surgery! How cool is that! Come in for a FREE CLR screening with Dr. McCabe or Dr. Foster to find out if you are a candidate.